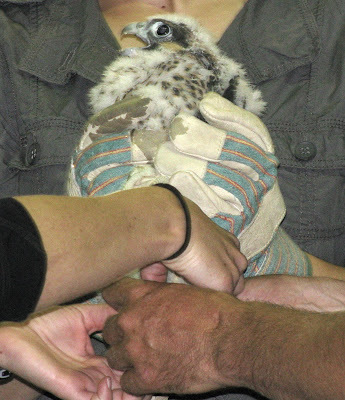 A not so happy Peregrine Falcon chick. Last Friday I got to indulge in two of my passions, birds and spa treatments! The Canadian Peregrine Foundation was holding a bird banding event at the Sun Life Financial building not far from where I live. I had not attended one of these banding events before, so I worked late a couple nights last week so I could leave early to attend the afternoon banding. It was interesting to see how this process is done, at Ruthven banding station we're banding adults songbirds caught in nets and traps, not raptor chicks from a nest box 19 stories up! 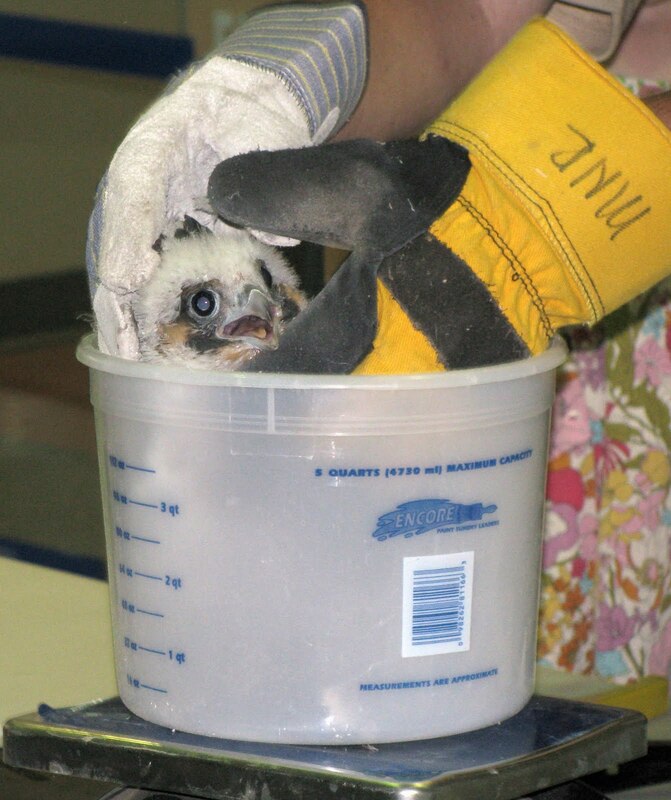 With the help of window washers who volunteer their time and equipment, the chicks are carefully removed from the nest box and then brought inside for the banding process. Each chick is weighed, sexed and banded. Then they are taken outside again and carefully placed back into the nesting box. All this is done under the supervision of the Minister of Natural Resources and staff as well as the Canadian Peregrine Foundation directors and volunteers, remember, these are federally protected birds. Time to get weighed! They look so cute in the big measuring cup. 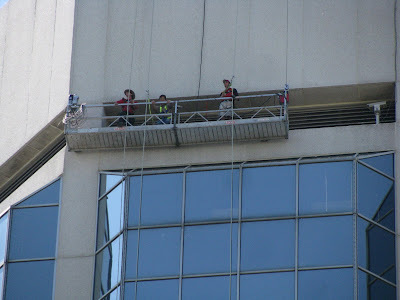 The three Peregrine Falcon chicks from the Sun Life Financial Building. I think the most interesting part of the procedure is actually going on outside while the chicks are inside. You see, the window washers remain outside while the banding is taking place, and the parent falcons aren't too happy. So, all the time the chicks are inside, the window washers are being swooped at by a pair of angry parent falcons! When it's over and the chicks are back in the nest box the parent falcons think they have succeeded in scaring the evil window washers away from their chicks! The evil "chick snatchers" that the parent Falcons scare off in the end! After watching the banding event and the parent falcons flying outside for awhile I was off to meet a girlfriend for a pedicure followed by dinner. A Dove Spa had opened not far from my house about a year ago, and this was the day I was finally going to check it out. I shouldn't of waited so long to go! It was very clean, relaxing and well staffed. They had a beautiful lounge area where you waited for your treatments and the treatment area was separate from the cashier/retail area. I've already made a return appointment. Pat and I enjoying our pedicures. This pretty colorful light really stood out in the mainly white surroundings. 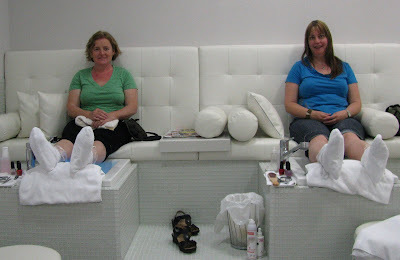 Pat relaxing in the lounge of the Dove Spa after our pedicures. It was a wonderful afternoon! And it looks like you and Pat had a fun time too!